This film, based on Lois Lowry’s book, tells the story of a perfect world. Everyone here is happy. When Jonas is 18 years old, he’s chosen to be the community’s Receiver of Memories. He enters into training with an old man called The Giver. 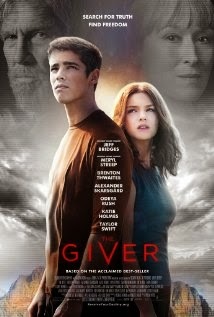 From the Giver, Jonas learns about pain, sadness, war, and all the unhappy truths of the “real” world. He quickly realizes that his community is fake. Confronted with this reality, Jonas faces difficult choices about his own life and his future. I’d like to state from the outset I have not read the book. Welcome to the society where all are equal, race and religion no longer exist and you are blind to what is different around you. From your day of birth you are chosen and watched as you grow, eventually into the perfect job for you. (Seriously, what kind of person where you if “Birth Mother” is your perfect fit.) Jonas is special, he didn’t fit into any one category, he fit into them all and so is chosen to become the new receiver. This lets him open his eyes to what he is missing around him, what is different and what others can no longer feel since the “Sameness” began. This movie is a very difficult movie for me to review. I’m slightly torn about how I feel and think, so I will separately focus on what I believed were the good points and what were the bad points. The Cinematography is stunning in this film. The colours slowly bleed into the story as more is revealed to Jonas and when the camera isn’t focused on his revelations it goes back to this one dimensional world where nothing is special. This follows very well with the films story line and works beautifully with the music. The choice of clips as memories are both happy and fulfilling. Showing a true joyous world. The acting was also wonderful even from the youngest of cast members. With Meryl Streep and Jeff Bridges the younger actors have a steep hill to climb to reach their level. This isn’t to say however that they were lesser, they just didn’t possess the gravity of Bridges and Streep in their acting and could sometimes leave you slightly… lacklustre. On a whole though the acting portrayed every emotion (or lack of) that you would want in this film. The storyline was thought provoking and imaginative with the idea that in the future a section of our society lost all ability to feel and differentiate emotions is a somewhat disturbing thought. Although we already see this too a much lesser extent with the use of mobile phones and social media. I believe the general execution of the film as a whole was just… lacking. It just had that dragging feeling that you are just waiting for the movie to really start and it never really does. As thought provoking as the storyline is, it doesn’t make for an engaging and interesting movie. It moves it towards forget-able. The most action we see is a punch and the use of a tractor beam. Yes, a tractor beam. Although I have only stated one bad point you have to remember how this will impact on the watching of the movie itself and the enjoyment factor. It is easy for me to look back and think “Hrmmm, what did I like an dislike about that film?”. What I really have to remember is what i felt coming out of that film. It simply wasn’t a film that would remain with me. It was watch able but that was about it. There was nothing to really sink your teeth into or get excited about. The whole movie just sat on one wavelength of understanding. So although it has all the wonderful point which work well separately when thought about, together it was just bland.